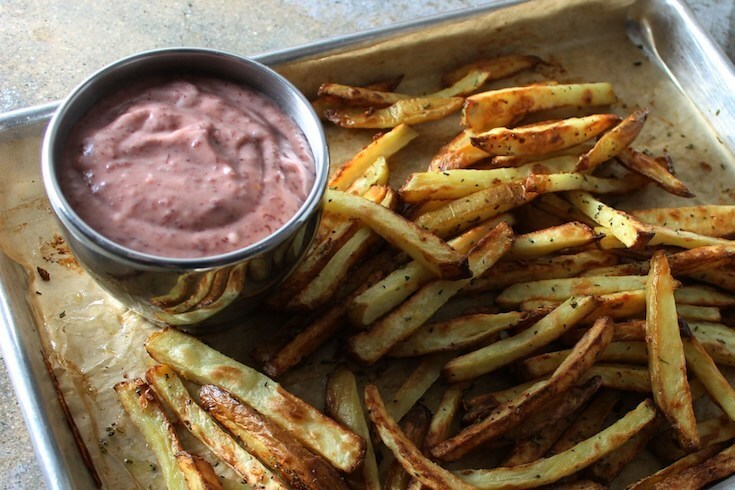 This Cranberry Dip is delicious with savory baked French fries but it also makes a delicious spread for sandwiches or wraps. In a small sauce pan, simmer the cranberries, water and orange zest for 10 minutes. Transfer to a blender and add the mayo. Pulse on high for 30 seconds until the cranberries are blended and the sauce is light pink. Transfer to a bowl and set aside in the refrigerator. Preheat oven to 400F. In a medium bowl toss the potatoes with the other ingredients to evenly incorporate. Spread out onto a cookie sheet, lined with parchment paper. Bake for 30-35 minutes, stirring every ten minutes until evenly golden brown.